American movies took ages to address Iraq and its satellite wars, and then tended to point fingers at the military. 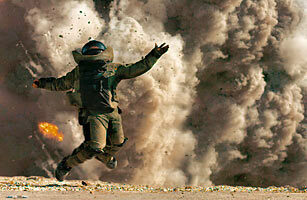 Not so in The Hurt Locker, a scary, thrilling patrol of the streets of Baghdad by men who defuse IEDs. It's a character study of a GI (Jeremy Renner, superb) with ice-water nerves and a go-it-alone bravado to match his ninja expertise. He tersely insists on doing his own thing, which is to keep little pieces of Baghdad from blowing up. Written by journalist Mark Boal and directed by action-movie maven Kathryn Bigelow, this is a war film that looks, feels and smells real; you needed to rinse off the grit after seeing it.